Since sewing labels take more effort than iron-on labels, they appear more handmade and charming. This makes them ideal for small boutique storeowners and crafters. They help continue the small business feel that you have worked to create in your business. These labels can also lend an elegant touch to bath and bed linens, and are ideal if you own a small bed and breakfast, or if you are giving monogrammed linens as a wedding gift. If you want to take your labels one step further, order sew-on woven labels. Woven labels have a classic look and, paired with the sewn-in look, will make your garments and linens look absolutely elegant. 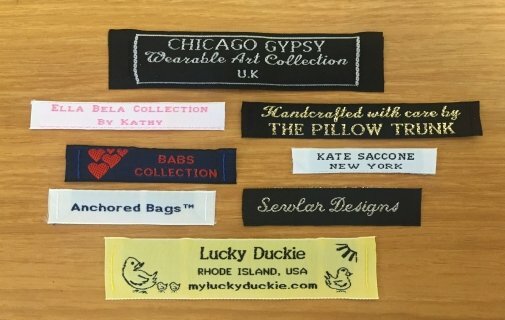 If your label may not be permanent, then you will definitely want to order sewing labels, as they can be much more easily removed than iron-on labels or ink transfers. The only thing to consider when ordering these labels is that they are attached only at the sides. This means, if you have young kids who tend to treat their clothes roughly, they can get torn off, and you may want to opt for iron-on labels. Regardless, sew-in labels do tend to be durable, and can last through many washes and regular wear and tear.